Welcome to the Brand New Danetti Website! Danetti offer a broad range of designer interior products for the home including modern dining sets, contemporary seating, stylish coffee tables and a wide selection of handy storage solutions. All our products are created by top designers in Italy and Europe and offer a sleek, sophisticated look to any modern living space or dining room, staying at the forefront of interior fashion. If you are looking to give your home a makeover with the cutting edge in interior design then Danetti can help with ideas and inspiration to get the most out of your home and allow you to fully enjoy the space you live in. Even our own Danetti.com website has enjoyed the benefits of a makeover, with the launch of our brand spanking new site. Like many homes in the UK, our site was in need of a little sprucing up so we have created an entirely new website to provide a better experience for our customers and to improve on user navigation, making it easier and simpler to find all the great products on offer at Danetti. 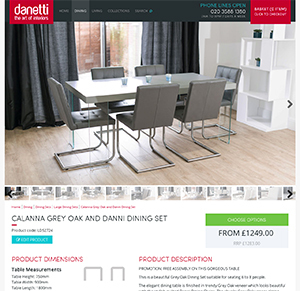 Danetti products are now split into two distinct categories of dining and living sections. So all you need to do is decide which area is relevant for you and choose from our amazing product range. With the new Collections page you can see products grouped by designer and brand, making it even easier to match items throughout your home and create a running theme of sophistication, style and luxury. For help with suggestions on interior design ideas from our in-house experts, see our ideas and inspiration page where you can find helpful tips and useful suggestions for improving the look and feel of your home. For more information on any of our great products contact our friendly team of advisors who will be happy to answer any queries you may have and can help you plan your ideal living space.